A super Turkey & Tinsel themed break in Torquay, The English Riviera. Situated on a rugged coastline, surrounded by Devons magnificent countryside, this is the ideal place to relax and enjoy the festive spirit including interesting visits and a fun filled entertainment programme. Monday  Christmas Eve our luxury coach will depart this morning and continue on to Street for a lunchtime stop. We continue for a short visit to the House of Marbles before our arrival at the hotel late afternoon. There will be tea/coffee and festive mince pies served in the Hydro Suite. Join us later for a complimentary drink in the Grand Lounge before tonights six course candlelit dinner. The evening continues with festive entertainment. Tuesday  Christmas Day a full English breakfast will be followed by a visit from Santa who will be waiting by the fireside with a small gift for guests that claim to have been good! We then take our coach to pretty Paignton for free time before we visit nearby Torquay. This evening we will enjoy a full Traditional Christmas Dinner with all the trimmings! Join us after dinner in the Hydro Suite for tonights evening entertainment. 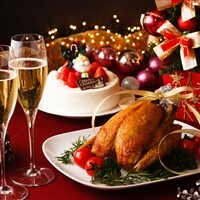 Wednesday  Boxing Day enjoy a full English breakfast and a morning at leisure in the hotel. There is a daily complimentary taxi service from our hotel to the harbour if you wish to explorer Torquay. This afternoon we are including a trip to the ever popular Babbacombe Theatre for the Christmas variety show, back to the hotel for dinner and another night of entertainment. Thursday  New Years Eve Today after breakfast we will be taking the coach to Trago Mills, the South Wests original discount retailer for an opportunity to do some Christmas shopping. We return to our hotel this afternoon for time at leisure. Why not take a stroll along the beautiful coastal footpath before joining us at 4:30 in the Hydro Suite for Chefs shortbread followed be a seasonal quiz. Our six course dinner this evening is in the historic Romanoff Restaurant followed by dancing and traditional singing of Auld Lang Syne at 11:00pm with a glass of Mulled wine. Friday  After a farewell breakfast we leave Torquay and make our way to Exeter for a chance to do some Christmas Shopping before returning to Warminster and our waiting taxis after our festive break. This elegant Torquay hotel is situated in one of the most beautiful parts of Torquay on the English Riviera, sitting majestically on the headland looking out to sea. It is set in two acres of magnificent grounds and offers stunning views across Torbay with numerous coastal walks nearby. With this in mind, it is hardly surprising that it is Torbay's highest rated three-star hotel. All of our bedrooms are en-suite, tastefully decorated and include: A direct-dial telephone, flat screen television, tea/coffee making facilities. Most of the rooms are accessible via the lift and there are a small selection of ground floor bedrooms on request. 4 Nights Dinner, Bed and Breakfast. Welcome Tea/Coffee and Mince Pies on Arrival. Tea/Coffee and Shortbread on Thursday Afternoon. Mulled Wine on Last Night.